Winter comes and it' s a good time to get married, or at least that' s what the protagonist of our next game has thought. It is the day of your wedding and we are going to have to do different facial treatments to make your face look perfect on the most important day of your life. You have to finish with all the grains and imperfections with which you have risen and so you can start applying makeup. Make her all kinds of facials so that her skin is perfect and we can make up her beautiful face. When it is ready we will choose the dress, a hairstyle and the rest will be to make up the girl. Prepare as many looks as you want and choose the one you liked the most. 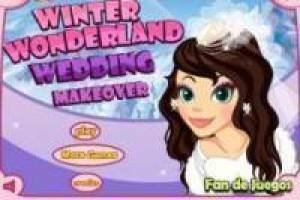 Enjoy the game Makeup in winter, it's free, it's one of our girls games we've selected.